Three years ago at BitSummit 2014, Inti Creates used its Mega Man Zero prestige to announce a new video game franchise called Azure Striker Gunvolt, and at BitSummit 2017, the same series found its footing once again with two new packages. The first of these was revealed by Famitsu earlier in the week. Mighty Gunvolt Burst expands upon the free tie-in game that Inti Creates made alongside the first Azure Striker Gunvolt game. 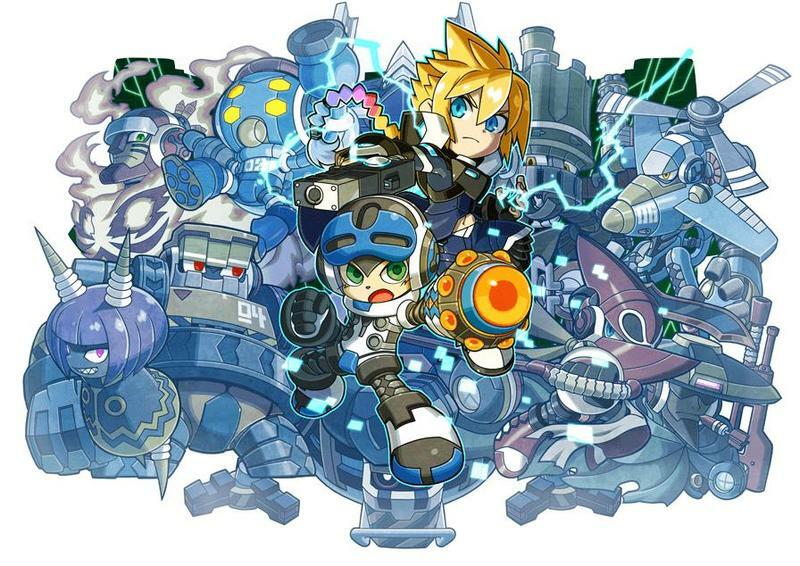 Once again, it combines the world of Mighty No.9 and Azure Striker Gunvolt in an explosive 8-bit action platformer. Inti Creates brought a trailer to BitSummit. We really enjoyed creating the original Mighty Gunvolt back in 2014, and with our duties with the Mighty No. 9 project being long over at this point, we began to miss working with these characters that we love, and wanted to share Beck and his mighty siblings with the world once again. Comcept gave us the OK to use the rights to these characters however we see fit (and free of charge too), and from there, we set out to bring them back to the stage in the best way we know how: 100% pure Inti Creates 2D side-scrolling action with excellent pixel art! Mighty Gunvolt Burst will launch on June 15 for the Nintendo Switch and Nintendo 3DS, and it will be $9.99. The other big announcement from the show turned out to be the Azure Striker Gunvolt: Striker Pack, which will bundle the first two games together for a release on the Nintendo Switch. The Azure Striker Gunvolt Striker Pack contains both Azure Striker Gunvolt and Azure Striker Gunvolt 2, two of our flagship games that originally made their home on the Nintendo 3DS. With the release of the Switch version of the Striker Pack, there are a host of new features, improvements, and bonus content that make it the truly complete version of the Azure Striker Gunvolt experience. Let's take a look at what's in store! This version boosts the original gameplay from 30fps to 60fps, and it comes with all DLC from the original and a new song in the soundtrack. Azure Striker Gunvolt: Striker Pack will be released on Aug. 31 for the Nintendo Switch. While it did not provide a look into an entirely original game this year, remember that Inti Creates is currently helping out with Bloodstained: Ritual of the Night as a full-time developer. Currently, it has too much on its plate, I assume.